While the Museum may be better known for our Thunder Days and our diverse aircraft collection, we also have the capacity to help other organisations with events of their own. 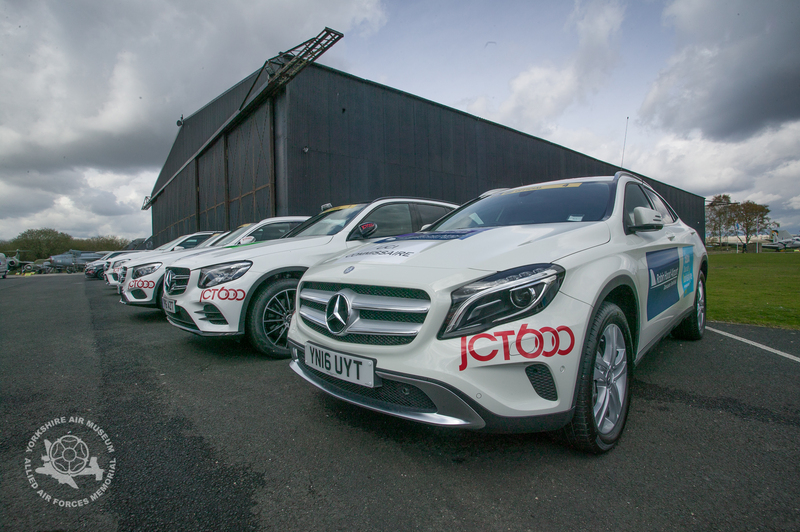 Car manufacturers, TV companies and others have all come to us in the past for specialist events, but they don’t come much bigger that the huge Tour de Yorkshire cycle race organised by the great team at Welcome to Yorkshire and the ASO. The race ranges across Yorkshire with press and TV coverage showcasing our area across the world. A huge amount of planning goes into making it such a huge success and we were proud to have been chosen as the location for pre-event press conferences and Race HQ for the event staff. The whole programme started several months ago with discussion about exactly what was needed including storage, press facilities and broadband speeds for the press to post their stories and images. This year, the Tour chose the Museum as the headquarters for the race control, press area and garaging for the Tour support cars. We were also the location for Press accreditation and the Tour de Yorkshire press conference on the Thursday evening before the race. Our semi-rural location means that our broadband speed needed improvement to cope with this the extra data traffic. We needed to solve this issue and with the excellent and speedy support from Sally Burns of City of York Council, and the staff at Digital York, help came from Boundless Networks. Their team installed a microwave broadband system with several repeaters located around the Museum, supplying genuine high speed internet around the Museum for the first time. The installation is so small and discrete, you have to search out the dishes and they blend perfectly into the period buildings. The Elvington Room was configured into a Press Centre, and the neighbouring NAAFI became the location for the Press Conference and photo call, whilst two other buildings became Race Control and Race Marshal Briefing Room. Meanwhile outside, some of our aircraft collection was rearranged to make room for Tour cars and equipment inside the hangar, as JCT600 delivered a whole stream of perfectly polished support vehicles. The actual race event itself is delivered by ASO, the team responsible for the Tour de France and also the Dakar Rally. In the lead up to the event, staff from Welcome to Yorkshire and ASO gradually began arriving, culminating in the busy press conference on the Thursday evening. It was a busy couple of hours before the travelling circus of the event moved onwards across the Yorkshire towns and landscapes, the motorcycle camera crews and overhead helicopter showcasing Yorkshire in a unique way in the following days. Thanks to the hard work of Sir Gary Verity’s team, Tour de Yorkshire is now firmly established as an international cycle race. Not just for cycling enthusiasts, but a spectacular rolling event that brings the best elements if Yorkshire to the entire world. Roll on next year!